Ilayathalapathy Vijay's recent release 'Puli' is doing some decent business in Tamil Nadu inspite of getting mixed reviews from audiences. Tamil Nadu's box-office collections are just average and it is struggling to keep alive. 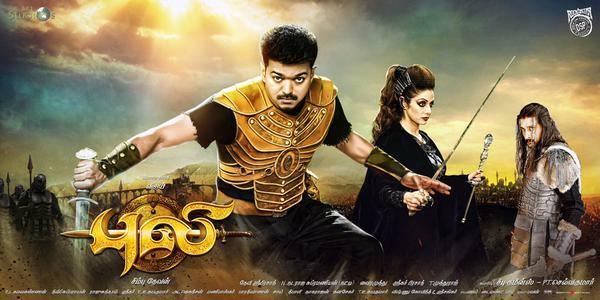 Now we heard a news that 'Puli' is heading towards bigg loss in North America. According to the reports movie performance in both USA and Canada is reportedly low, causing bigg loss for ATMUS Entertainment, who distributed the film in these regions. 'Puli' was expected to gross at-least 3-4 crores in United States, but it has so far managed to gather just 1.21 crores and it is likely to end up with just 1.25 crore rupees. In Canada 'Puli' earned around 60 Lakhs. As per the trade analysts, 'Puli' is likely to gather a total of 2 crores rupees from Canada and United States combined, thereby ending up with a loss of 4.5 crores.